Update: Baltimore County Police have arrested and charged Lauren Paulette Valiquet of the 100 block of Fuller Avenue for the robbery of a 7-Eleven in the 7600 block of Belair Road. She is being held at the Baltimore County Detention Center on $1.5 million bail. We know this picture isn’t the best but we’re hoping there is something about this woman that looks familiar. Baltimore County Police say this woman is responsible for a robbery at the 7-11 store located at 7631 Belair Road in Baltimore County. The robbery happened November 5th and police say the woman was with a man. Detectives now say the man is also a suspect in several robberies in the Belair and Harford Road corridor. As this investigation continues Baltimore County Detectives have learned the male suspect and female suspect entered the store together, walked up to the soda fountain machine and got drinks. The woman then walked up to the counter, appearing to be ready to pay for her drink. As the cashier opened the register the male, who entered the store with her, walked around the counter, told the cashier to keep the register open, and took money. The woman is described as 20-25 years old, 5’0”-5’2”, 170-180 pounds with light complexion. 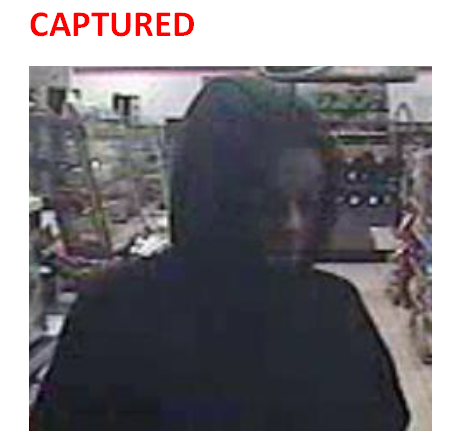 The male suspect is believed to be involved in a robbery at a Baskin Robbins store. Click here to read more on the previous robberies in the area.